As I’ve promised, I will be devoting this post to discuss The Solar Living Institute (SLI) (www.solarliving.org). The Solar Living Institute is a non-profit educational center specializing in solar training and sustainable educational classes. These classes/courses are taught either on site or online by experienced practitioners, helping students to prepare for getting jobs, creating businesses in solar industry and for learning to live more sustainably. SLI also manages the Solar Living Center, a 12-acre renewable energy and sustainable living demonstration site visited by 200,000 people annually. Ultimately, the Solar Living Institute’s mission is to promote sustainable living through: renewable energy education classes/courses; tours for schools and various organizations to demonstrate and inspire sustainable and solar living ;residential internship program for young adults to offer green tech and sustainability education in seven month session; and selling and installing solar systems in the Southwest part of USA. Did you hear what John said about “only about 0.1% of US homes are now powered by solar whereas there are about 5-10% of the German homes are now powered by solar energy when Germany is actually getting less sun than we do….” We need to catch up in this journey toward energy independence and self-sufficiency! 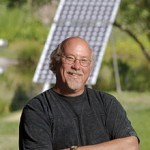 My hat’s off for John Schaffer, a living example of Solar Living for all of us! In the next post, I would like to take you on a tour of one of the past SolFest at the Solar Living Institute, normally held in late summer of each year. in 1998. The institute offers workshops onsite (at Ukiah, CA) and online (here is a sample chapter from the Solar Training Online course offered by Solar Living Institute, below), yearly internships, and hosts SolFest (the renewable energy festival that attracts more than 10,000 people each year.) They have a Intro to Photovoltaics training course starting in Jan. 21-22, March 17-18 and a PV Design and Installation Intensive training course coming up in Jan. 23-27, Feb. 20-24, March 19-23. Check it out if you are interested. Let me know your thoughts on these courses once you’ve taken any/them. Our readers are interested in hearing any of your remarks.